Roundwood Cancer Support Group has recently held two fundraisers. We would like to thank all those who supported our night in Shelbourne Park, for those who organised the raffle & donated prizes & a big thank you to Eugene Shortt & his helpers who organised this event which turned out to be a great night & raised €5,000 for the group which is a fantastic amount. We also held a table quiz which was real fun night & raised €735 & thank you to all who came along and especially to Paddy O’Brien who set the questions & all his helpers. We have now secured two rooms in The Parish Centre thanks to the Parish Hall committee which we are very grateful for. They are in the process of being painted & we’ve purchased blinds for the windows. We hope to be up & running in our centre in approximately six weeks. Thanks again for your support. Margaret Bolger took 1st place on Monday 17th this time with partner Ger Lenihan for North/South, 2nd Margaret Byrne and Triona Woodroofe, 3rd Rowena Brady and Gaye McGettigan and 4th Monica Brady and Bridie Nolan. Judy Skates and Maria Magee played their cards right to take 1st for East/West, 2nd Teresa Leahy and Marian Davies, 3rd Catherine Halligan and Phil Power and 4th Maura Gaskin and Kay Plunkett. A reminder that the Active Retirement Lunch club will take place on Friday 19thOctober in The Coach House Roundwood at 1.30. The monthly car boot sale will take place in Roundwood Parish Centre on next Sunday 13th October from 12 noon to 4pm. It is proposed to have our November car boot sales on the second Sunday of the month on the 10th November. The final concert in the Music in Calary 2018 series will take place in Calary Church at 8 pm on Friday 5 October when Musici Ireland will play Johann Stamitz’s Bassoon Quartet No 5 in Bb major, Beethoven’s String Trio in C Minor Op 9 No 3, Franz Danzi’s Bassoon Quartet Op 40 no 3 in Bb and Mozart’s Bassoon Quartet in Bb. Tickets for the concert are €18 and €15 for concessions and, for further information or to book tickets, please ring John at (01) 2818146 or email derekneilson@eircom.net. Rebecca Delamere will be teaching group Maths lessons on a weekly basis in Roundwood for first year students. Class sizes will be very small. These lessons provide support for students who may be struggling with Maths or students who are aiming for high grades and also prepare students for their Maths exams. To reserve a space or for further information, please contact Rebecca on 086 0650129 or rebeccadelameremathslessons@outlook.ie. 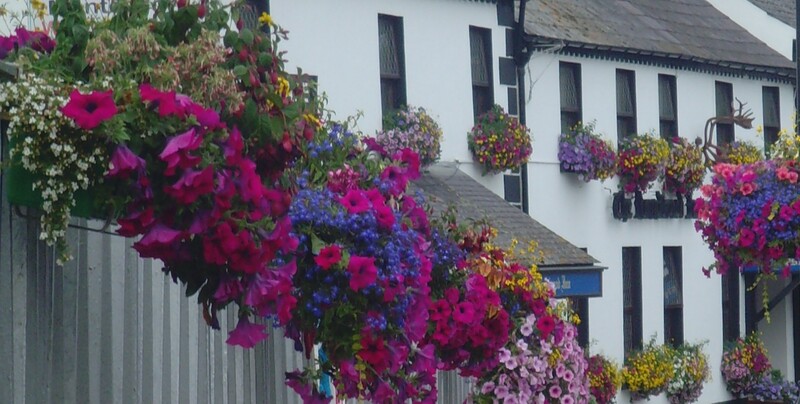 There will be a music weekend in Donegal from the 2nd to the 4th November This will be a three day coach tour at a price of €289 per person sharing. 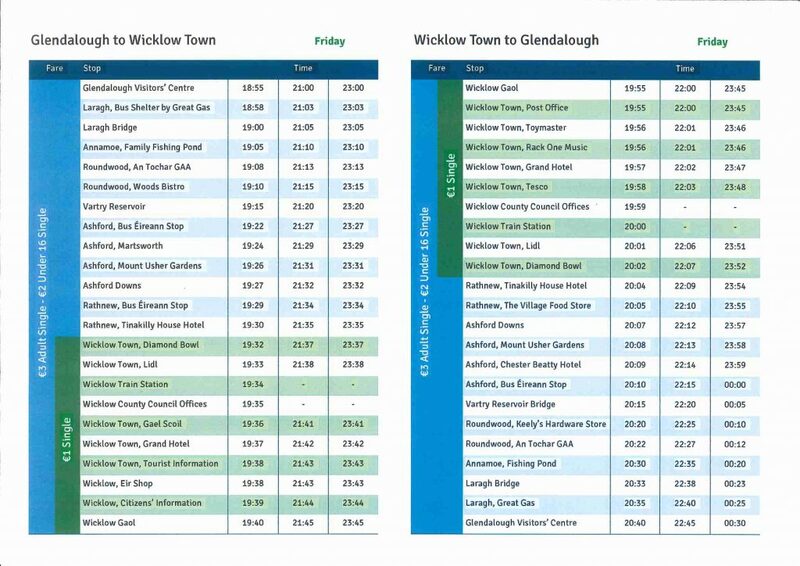 The price includes the bus from Roundwood to Donegal and back to Roundwood, two nights dinner, bed and breadfast in 4 star Clonee Hotel, Letterkenny with music nightly with Lisa McHugh, Derek Ryan and Gerry Guthrie. A depost of €100 is required before the 25th September. Names to Susan at 087 6273032 and remainder of money to be paid before 15th October. The bus will leave at 8.30a.m from Roundwood. Roundwood Whizzers Walking Group are back in action meeting at 7pm every Wednesday at the Coach House car park. All welcome to walk at your own pace for approximately one hour. In association with GET IRELAND WALKING the Roundwood Whizzers Walking Group are participating in the National Community Walking Day on Sunday 30th of September as part of European Week of Sport 2018! Our walk will start from outside the Roundwood Parish Hall at 2pm for approximately 6km on the Vartry Reservoir Trails. All welcome. Thanks to the people for supporting the recent 45 card game held on Sunday 16th September in aid of the Mustard Seed Communities. The amount raised on the night was €300. Next Roundwood Parish Hall Dance Friday26th October with music by Jimmy Hogan. The next Whist is this Wednesday 26th September in The Parish Centre, Roundwood. There was no jackpot winner in last weeks draw. The numbers drawn were 4, 9, 21 & 23. There were nine match three winners Mary Vickers, B. Lawless, Sharon & Joe, Ciaran McKenna, Dawn Furlong, Jim Carr, Martha Hill, Kym Turner & D. Keane Next weeks jackpot will be €20,500 The lotto celebrates 25 years in existence this year and to celebrate this there will be a €3,000 jackpot for match three win or share on Sunday the 14th October. This entry was posted in News & Events on September 24, 2018 by roundwoodiewicklow. This new bus route is starting on Friday September 21st. It is only a Friday evening service at present but it is hoped to extend the service. Like a lot of services – it’s use it or lose it! 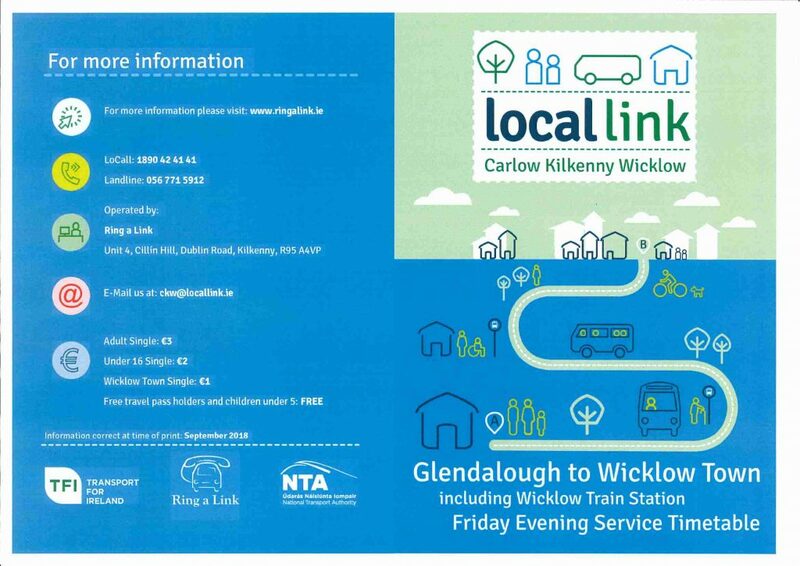 “We have been working closely with the NTA to secure a 7 day a week service from Glendalough to Wicklow town. The need for this service was identified early in consultation with local stakeholders and in literature/data reviews. The success is testament to the work already undertaken and enthusiastic engagement by local stakeholders and participation by the general public in highlighting their transport needs and wishes…. 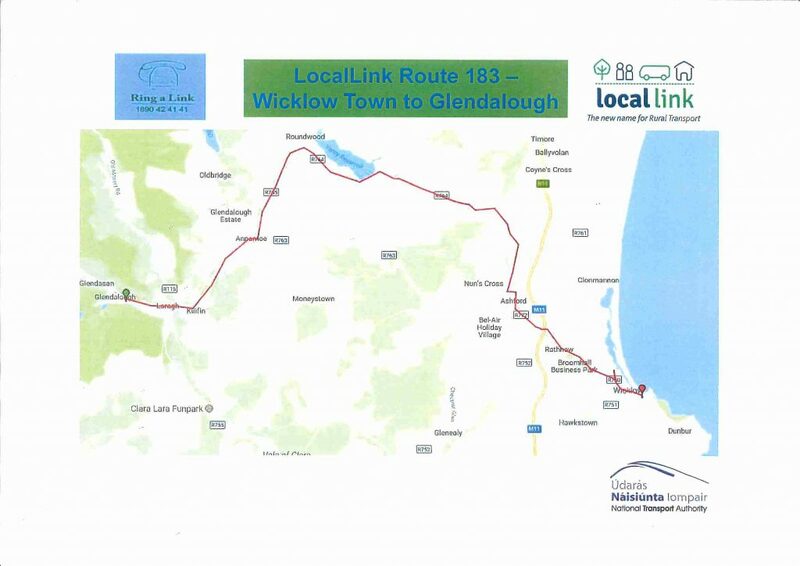 This entry was posted in News & Events on September 14, 2018 by roundwoodiewicklow. The monthly car boot sale will take place in Roundwood Parish Centre on Sunday 13th October from 12 noon to 4pm. It is proposed to have our November car boot sales on the second Sunday of the month on the 10th November. The Wicklow Man will play in Moneystown Community Centre on Friday 14 September from 9.30pm till 12. Teas served, refreshments also available, door prizes. Come along and enjoy a night of waltzing, jive, linedancing, etc. Bridge resumes for the above club on Friday 14th September in Roundwood Community Hall starting at 9.45 not 10.45 as previously advertised. Visitors and New Members always welcome. Diamond Bridge Club resumes play on Monday 10th September starting at at 7.45. New Members and Visitors always welcome. The next Whist is this Wednesday 12th September in The Parish Centre, Roundwood. The next talk in the Roundwood Historical Society’s 2018 Series will take place on this Wednesday, 12th September 2018 at 8pm in the Roundwood Parish Hall. The talk is based on the book “Aghowle: where the divil ate the tinker”, written by Margaret Connolly. Margaret published this book on the history of the townland of Aghowle and its farming community in late 2017. Aghowle is located approximately 1 mile from Moneystown and 4 miles from Ashford village. Margaret grew up on a small farm in Aghowle where ancestors on her grandmother’s side had lived since the early 1800’s. Margaret will discuss the social history of Aghowle based on her intimate knowledge of the families who farmed there over the years. Her account is based largely on her own experience and on the recorded memories of her own family and others who lived in the area. The book records a way of life that is now almost completely disappeared and highlights the importance of recording our own local history before it is lost forever. The talk will include a display of over 100 photographs from the book. We look forward to seeing you on Wednesday 12th September at 8pm. The entrance fee for members is €3 and for non-members is €5 – payable at the door. The following concert will take place at 8 pm on Wednesday 12 September, at The Janet Ashe Memorial Concert, Fiachra Garvey (piano) will play works by Brahms, Chopin, Field, and Rachmaninov which he will be performing in Germany three days later and at various U.K festivals.3. At 8 pm on Friday 14 September, Miriam Roycroft (cello) and Lance Coburn (piano) will play works by Beethoven, Chopin, Martinu and Moeran.Tickets for these concerts are €18 and €15 for concessions and, for further information on any of these concerts or to book tickets, please ring John at (01) 2818146 or email derekneilson@eircom.net. This entry was posted in News & Events on September 11, 2018 by roundwoodiewicklow.